Electric blue, hot pink, or highlighter yellow – neon shirts have proven time and time again that they are here to stay. This radiant trend has had made an appearance through different decades but it has re-surged and is better and bright than ever. Due to advancement in fabric and dye technology, neon apparel pop more, they don’t rub off on your skin and they stay bright after washing them. More and more people are jumping on the neon band wagon from performance wear to high fashion. So how can this classic take on a new approach for the future? With customization of course! 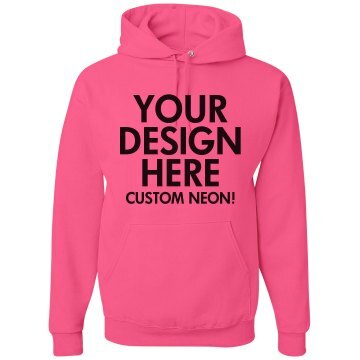 Not every company can offer neon shirts with the ability to print on the garment, but printing on neon is one of our specialties at Customized Girl. With our direct-to-garment printing, the color of the ink merges with the color of the shirt giving your look an awesome vintage aesthetic. We carry some of the hottest brands like American Apparel and Bella, so you don’t need to settle on just any custom neon shirt. Take any design from our gallery or start with a blank item. We offer hard to beat no minimums and generous group discounts that allows our customers to create matching shirts for an entire group or that one trendy top you have to have. 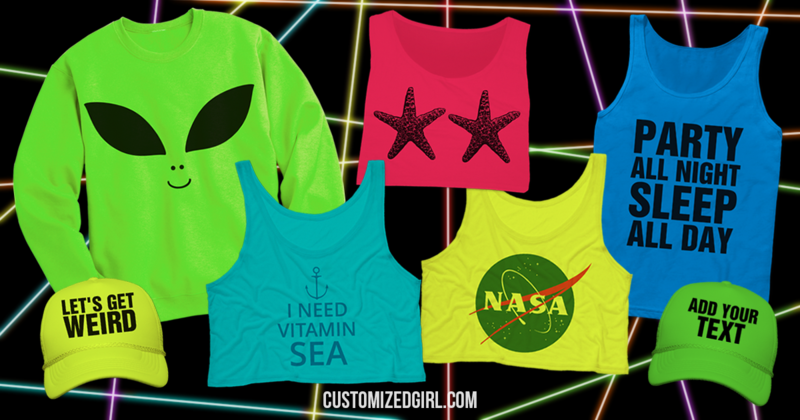 The possibilities are truly endless with custom neon shirts but it doesn’t have to stop with tees, tanks, and hoodies. 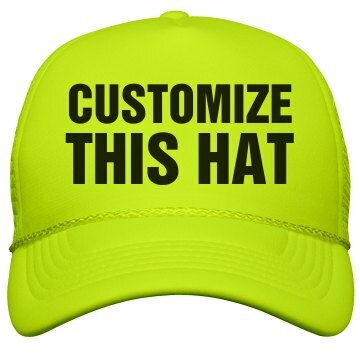 Design a custom neon trucker hat or neon koozie to complete the perfect ensemble for that beachy getaway or that midnight glow run! May is a special month for those who has served or are currently serving . The entire month of May provides an opportunity to say thanks to all servicemen and the strong families who support them. Military appreciation month is important to us at Customized Girl due to the fact a large portion of our customers are dedicated girlfriends, wives, and fiancees to military servicemen. 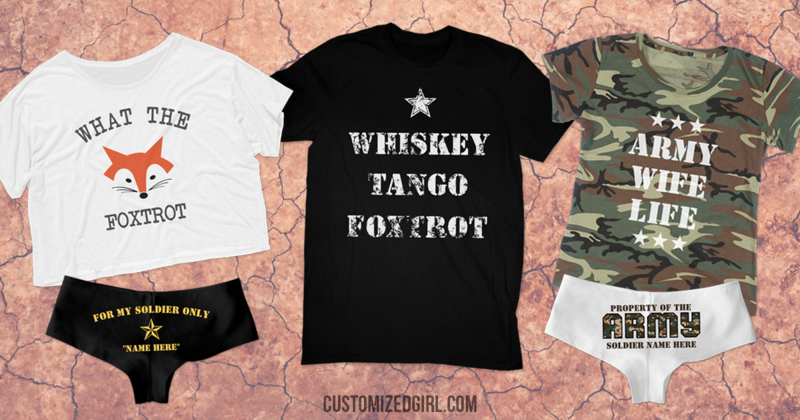 Customized Girl understands that one month alone is not enough to recognize the sacrifices that these men and women give to our country and we want to help honor our military all year long with the best military wives and girlfriend shirts. 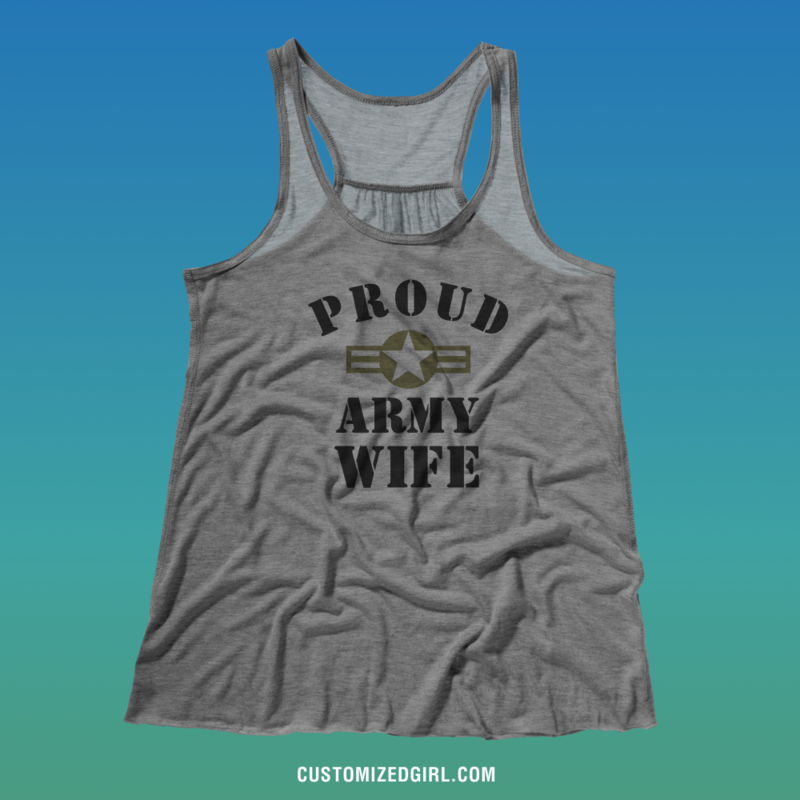 Our gallery is full the best military wives and girlfriend shirts that are ready for you to customize. Personalize each design with names, dates, and military rank. You also have the ability to swap any design onto any product and color of your choice. 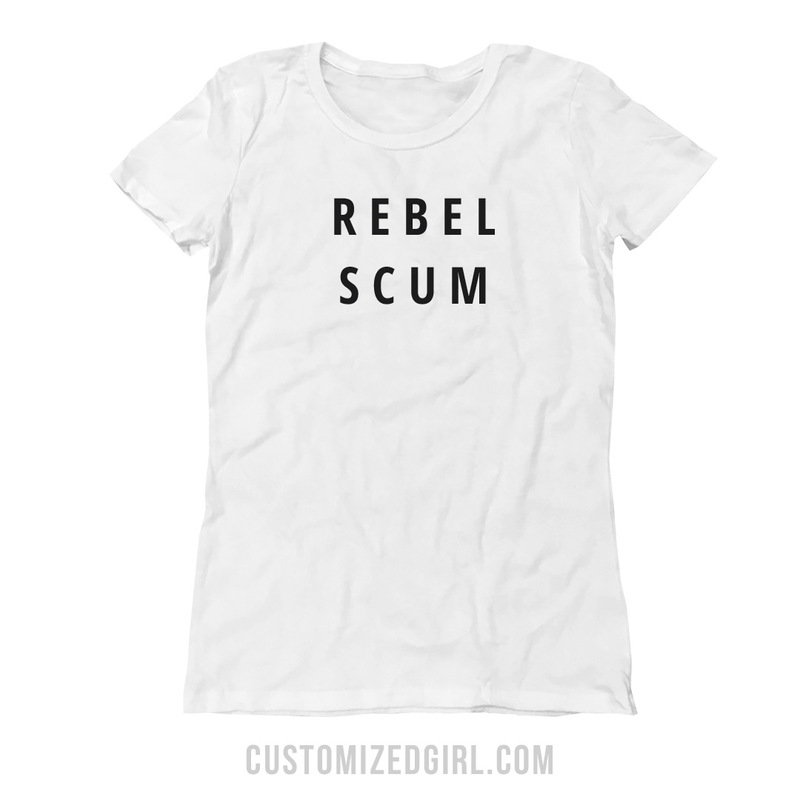 We have the biggest and trendiest selection of customizable women’s styles on the internet. Plus tons of great accessories like socks, hats, and more. While we may offer the best selection of women’s apparel that doesn’t mean we forgot about the fellas! Customized Girl also offers a huge variety of men’s apparel with the same option of customizing or swapping out any design in our vast gallery. Creating custom military shirts to spouses, parents, and siblings is Customized Girl’s way of saying thank you for all you do. If you have a specific design in mind reach out to our amazing customer service team and they would be more than happy to help you achieve that perfect design! We love seeing customer designs that support all branches of the military. Help share the love and appreciation by tagging us in your pictures @CustomizedGirl via Facebook, Twitter, or Instagram! May is the official month for Lupus awareness. For those who don’t know what Lupus is, it’s a chronic autoimmune disease that can damage any part of the body. It is difficult to diagnose and currently there is no cure. Dedicating an entire month to this disease helps increase public understanding with fundraising, promotions and educational services. 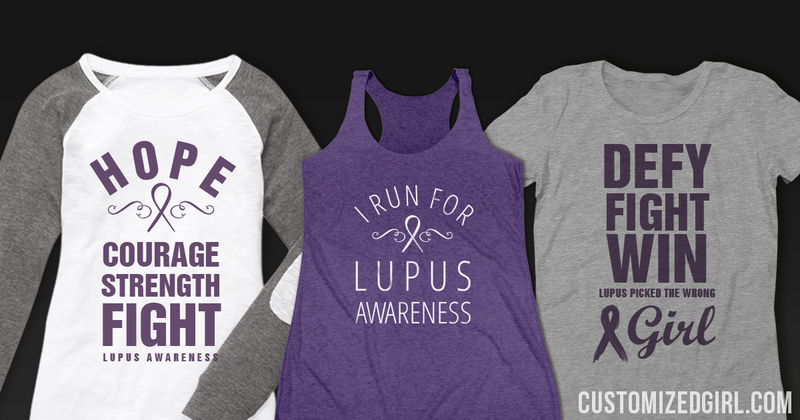 In honor of those who are fighting against Lupus and for individuals helping spread awareness, Customized Girl has created a gallery full of Lupus awareness shirts. There are a number of ways to support those affected by Lupus. One of those ways is to wear purple apparel to raise awareness. Customized Girl strives to bring the best in custom apparel and every year we want to provide our customers exactly what they are looking for. 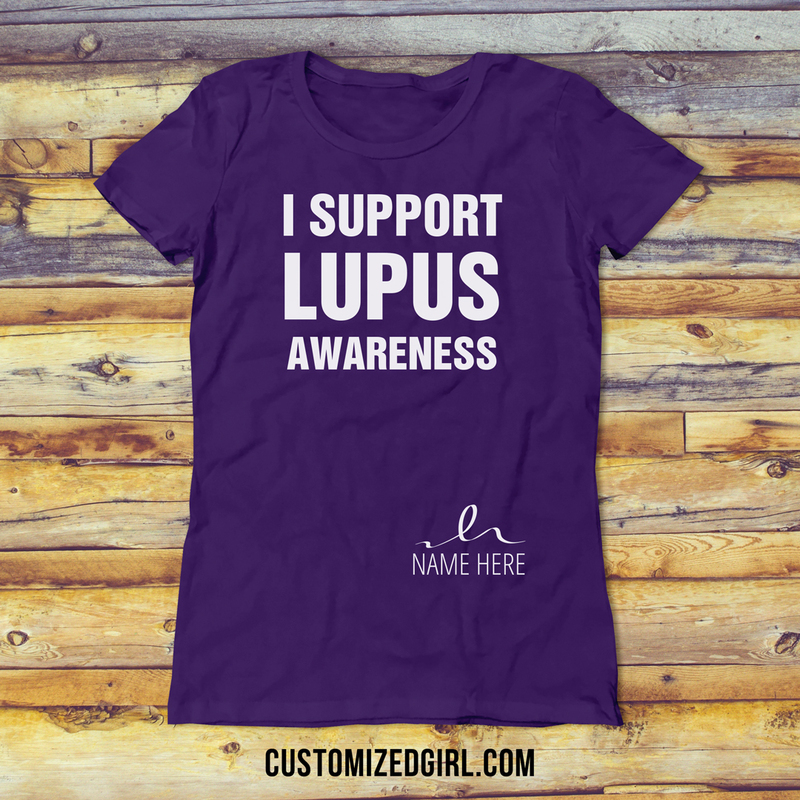 This includes adding new art and designs to help the cause against Lupus. We offer a variety of styles in apparel and accessories that include sizes for women, men, and children. All our users have to do is simply upload an image or logo of the name of the event, cause, or charity and add it to any product. If Lupus is near and dear to your heart then Customized Girl Storefronts is a great way to have your message be heard. Storefronts are an excellent opportunity not only to spread awareness but to also raise funds towards your charity of choice. There are absolutely no start-up costs to open a storefront, nor will you ever pay a fee to maintain your storefront. All you have to do is sign into your account or create one. Next you will be able to create a store URL, title, and description. Simply design the tees, tanks, sweatshirts, and accessories you’d like to sell for your organization, promote your storefront to volunteers and supporters, and collect the royalty earnings to use for upcoming events or general fundraising needs. It’s really that easy. Interested in starting a storefront to spread awareness and raise funds for your cause? Let us know at CGstores@eretailing.com. We can help you setup, advertise, and even assist with art. Check out our storefront FAQ and start designing! April 2017 Instagram Selfie Winner! 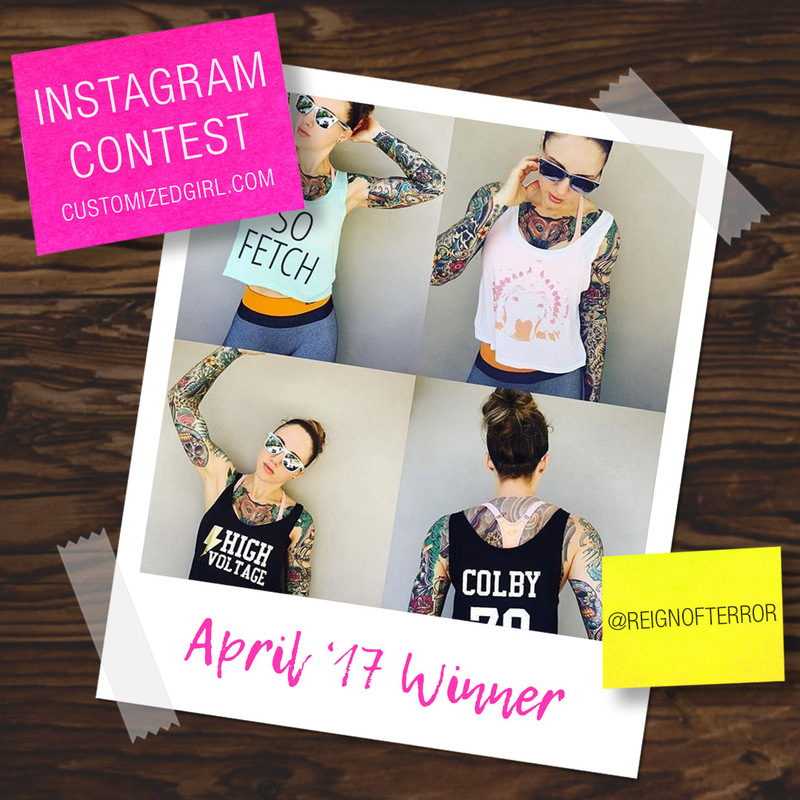 Let’s hear it for Customized Girl’s selfie winner for the month of April! 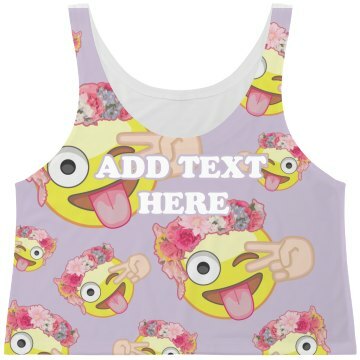 Our selfie winner for the month of April didn’t just snap a pic of one custom crop top instead she snapped four pics of all the crop tops she customized on Customized Girl. She showed how easy it is for any user to create whatever they want within our one of a kind design center. Creating three different designs – a design with just text, another with an uploaded image, and a third using our new metallic printing process. Her unique style and creativity makes her our ideal label rebel. Don’t forget about mom this year. Create a custom mother’s day gift and use the coupon code below to save! Use coupon code YM7ACG at checkout and get 5% off orders of $25.00 or more! Offer expires 5/31/2017 at 11:59PM EST.